Critic Todd McCarthy led the Q&A with Boyle, which started on a funny note for a tribute. “You should always try and look forward,” Boyle stated when asked if the clip show had made him reconsider if he would have done any of his previous projects differently. The lively Q&A painted a picture of a young filmmaker and theater director who thought (and still does) that “Apocalypse Now” is the greatest film ever made, and that the label of “MTV filmmaking” was a compliment. Boyle himself defined his style as visceral, but asserted that he thinks his films are mostly made in the editing room; that film is an editing medium most of all. Speaking of editing, press had been told the previous day that Boyle was working on the final cut of "Steve Jobs" at the time, and even at this World Premiere on Saturday night he stated to the audience that “It isn’t quite finished.” Still, he gushed about the work Michael Fassbender put into his performance. Boyle stated that he didn’t see Fassbender look at the script very much, if at all, on set because of the preparation he had done in advance of shooting. Specifically, he remarked that “[Fassbender] absorbed the script as if he had written it,” which is no small feat considering the nearly 200 pages of dialogue. “Steve Jobs” reveals itself pretty quickly to be more than just a standard biopic about the Apple guru, and it’s even better than one might expect for that very reason. It’s an interpretation of Jobs’ life, one that features true characters and events, but one in which evoking the power of Jobs is more important than duplicating him (making the fact that Fassbender doesn't look like Jobs moot). The same can be said for the setting of the film, which frames Jobs as he tries to launch a different product in 1984, 1988 and 1998. These scenes do not take place in Apple headquarters (though there are some flashbacks), but the stage of each unveiling, and the backstage where Jobs’ life threatens to fall apart. 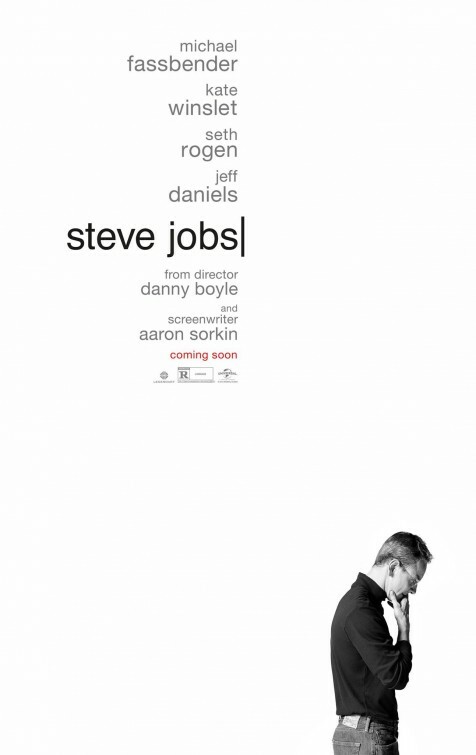 Sorkin’s marvelous screenplay (adapted from Walter Isaacson’s biography) is structured as a series of setbacks to Jobs' egomaniacal control, and the writer carefully defines this cinematic version of Jobs through his interactions. His friend, Steve Wozniak (Seth Rogen, holding his own opposite a titan-like Fassbender), wants Jobs to accept that others have been a part of his success, but Jobs refuses. Jobs has a child, Lisa, by a woman, Chrisann (Katherine Waterston) that he didn’t marry, and doesn’t respect or support. And then there is the right-hand woman trying to rein in his chaos, Kate Winslet’s Joanna Hoffman, the former marketing chief of Macintosh. Including performances from Michael Stuhlbarg, Jeff Daniels, and Perla Haney-Jardine as 19-year-old Lisa, “Steve Jobs” boasts one of the strongest casts seen this year, its energy motivated by another impressive turn from Fassbender. His intensity is channeled succinctly into Jobs, and like when he wore a papier-mâché head for most of “Frank,” the already-acclaimed actor proves he still has more sides to him. In this piece, he takes on a superstar’s angst, but with Jobs’ meditative stillness. Fassbender especially shines in the 1998 sequence, handling its many climaxes with immaculate control. Whether in Sorkin’s dialogue or Boyle’s direction, there hardly seems to be anything wasted here. Their styles create a marriage in which Boyle can jolt the aesthetic experience by challenging the reality of the visuals (the film stock pretends to burn out, and later the digital image pretends to glitch up), while Sorkin’s mind for dialogue and character remains grounded, having sharp people speak with an even quicker tongue, especially when trying to take each other down. It might take a couple viewings to catch all of Sorkin's prose, but Boyle’s packaging of this story, immediate or restrained when it needs to be, makes that notion sound very rewarding. As with “The Social Network,” Sorkin proves again that he can paint a fascinating portrait with artistic license, creating an art that is more resonant, and more alive, than mere facts. “Steve Jobs” is embedded in Apple lore, and creates an electric drama out of these launches, but its setting, dialogue, and thorough creation of character make this a timeless story of a brilliant mind, an observation of a definitive leader who thought differently, and viciously, and would make any sacrifice to achieve more power. “Steve Jobs” matches the mythic presence of the Apple god, who can’t be condensed in one film (as many others have), but can exist as an ideology. It’s the only type of storytelling that suits a massive, but elusive, figure such as Jobs. While not holding back on how much of a tyrannical jerk he was, Boyle's film proves Jobs was exactly right that momentous art is achieved when creators, including writers, filmmakers, or even casting directors, think differently. Next Article: Telluride 2015: "Hitchcock/Truffaut" Previous Article: Venice Film Festival 2015: "Equals," "Francofonia"